Al Condoluci's presentation at the Inclusive Play Symposium dealt with Social Capital - the idea that social networks have intrinsic value. Two categories are central to social capital theory: bonding social capital and bridging social capital. The first refers to groups made of members who are similar and the second to those whose differences make linkages between them less likely under other circumstances. Network Theory observes that the number relationships for a given entity (node) vary widely. Clusters can be seen in graphs of relationships resembling islands and continents with bridging nodes exercising leverage roles between clusters. For many people without a disability linking with a PwD, even in their own community, creates bridging social capital (in both directions.) Given the difficulty of travel with a disability the scarcity of contacts created by PwD in foreign countries can be a quite unique bridging relationship. 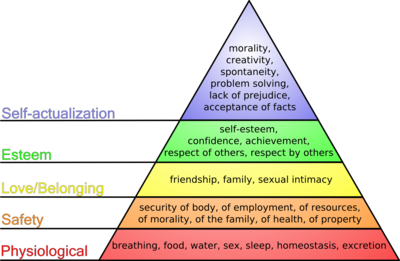 The term prosocial behavior describes acts that demonstrate a sense of empathy, caring, and ethics, including sharing, cooperating, helping others, generosity, praising, complying, telling the truth, defending others, supporting others with warmth and affection, nurturing and guiding, and even the altruistic act of risking one's life to warn or aid another. Individuals and networks accrue social capital. Prosocial behavior allows for retention of those assets. Acquiring the capacity for prosocial behavior is a developmental task. Play facilitates such development. If "play is reaching out for joy and leisure travel is a search for new playspaces and playmates" in the acquisition of social capital then what is "hospitality?" Hospitality is the application of prosocial behavior to strangers precisely because they are strangers. Hospitality is a strategy to foster bridging social capital. Whether highly altruistic or calculated in its aim of accruing social assets for those participating hospitality often includes highly symbolic and ritualized behaviors designed to lower anxiety and facilitate trust in the ambiguity of first encounters. "Aloha" (Hawai'i) and "morabeza" (Cabo Verde) are just two culturally specific instances of prosocial behavior to strangers (hospitality). What do these cultural formations of welcome and bridging manifest when the stranger is a person with a disability? What bridging opportunities are permitted or denied if one is a person with a disability? Are all the constituent prosocial behaviors shown to a visitor with a disability? Expect of her/him? Wrapping up an event is an honor and a challenge. My topic, "Playing Around the World: Inclusive Tourism" allowed for a review of all the topics covered during the symposium and then a look at how these might be manifesting around the globe. I began with the thesis that play is a reaching out for joy and leisure travel is a search for new playspaces and playmates. There is no "one moment" when Inclusive Tourism advocacy began for me. It is a responsibility that every person with a disability slips on like a backpack as soon as they decide to move beyond whatever is their home geography. It is a choice to be fully human. Three things motivate me to continue. First, the idea immediately attracts collaborators. Expressing the definition of Inclusive Tourism very precisely, in a way that describes the solution, makes it easier for others to grasp and take in as their own. That solution is the collaborative process known as Universal Design (often known in the EU as Human-Centered Design or Inclusive Design). The second motivator is a commitment to the disability community of future generations. I was unable to fulfill my undergraduate scholarship in Linguistics at the Universidade de S?o Paulo in Brazil because the facility was not accessible and its institutional culture was not inclusive. Inclusive Tourism is one way I make certain that new scholars in every part of the world are free to study and enjoy full citizenship. Mobility International USA (MIUSA) is the world's leader in the area of training on student exchange involving students with disabilities. They have created a new generation of academics and professionals with disabilities who will never let this occur again. I am able to continue because of the foundation laid by people like Susan Sygall, founder of MIUSA and her collaborators spread throughout the world. Thirdly it is the friendship - the generosity and bottomless resiliency - of those I have the joy of working with around the world that makes this a passion. The secret-hidden-in-plain-sight about disability culture is exactly the opposite of what TABs (Temporarily Able-Bodied people) think. Here's a bit of video I showed to counter the image of disability-as-tragedy or people with disabilities as spunky heroes. I like these cheeky little ankle-biters! They would definitely make for fun travel companions. There was a completely unexpected sub-theme running through the presentations at the Inclusive Play Symposium, "Inclusion is more than accessibility." Accessibility was the rallying cry of a a political movement springing from the civil rights era of the 1970's. Inclusion is a social ethic reflecting a globalized, networked world where freedom of movement and the full participation of all is taken for granted -- and enshrined as a right. Inclusion expands your market. It just makes good business sense. Accessibility is passive - leaving the door open without obstacles in the way. 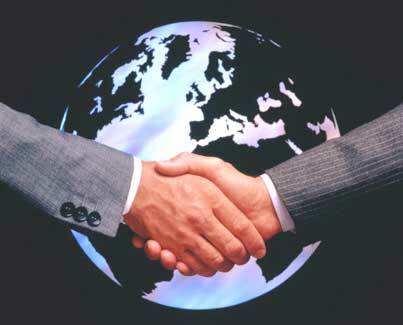 Inclusion is active - inviting you in to the human network beyond the newly barrier-free doorway. Accessibility looks backward. It tries to hold the line at outmoded and artificial standards of "normal." Accessibility degenerates into "mere compliance"; obsession with checklists; PwD as risk management problems; and performance according to the "least worst" standards - whatever could be institutionalized after the political compromise of legislation and regulation. Disability can make one life stage intrude on another when design and policies create barriers that limit one's independence. They complicate both the how and the why of travel. The skill is to anticipate these life-stage collisions when they are predictable or embrace them with grace when they are not. 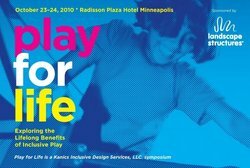 Preparing to address their Inclusive Play Symposium I reviewed the literature on development and play. I found that LSI is well-versed in the research behind development and disability. The research made me wonder when the knowledge that has made them leaders in their industry will cross domains into the travel and hospitality industry. Maybe as more inclusive playgrounds sprout up at resorts, timeshares, vacation and sports destinations - theme parks like Morgan's Wonderland? 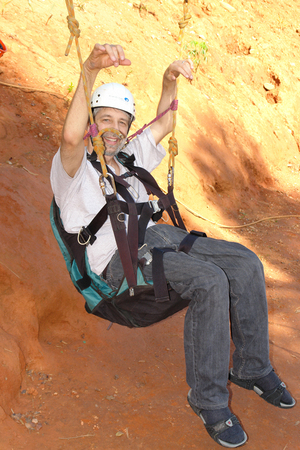 Adventure Parks like Parque dos Sonhos? Meanwhile we continue to learn from the masters. But the most helpful summary of all did not come to my attention until a presentation by Ingrid Kanics. 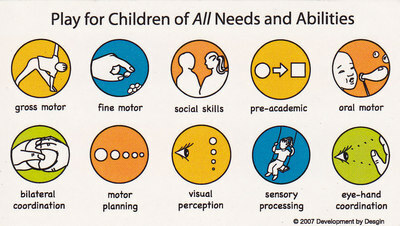 This has obvious application to childhood development and rehabilitation. It can be a helpful reference in aging. LSI uses it successfully to determine how complete their array of play products is. Can we use it to refine user experience of travel itineraries for PwD? Can we design spaces and offer experiences that suit the developmental baselines of comfort common to certain disabilities? Or maybe we still need the message driven home with extreme sports - a few more wheelers like Aaron Fotheringham showing us how much fun vestibular stimulation can be!